I will have to steal their idea of having a page of ingredient substitutions. That's highly useful. 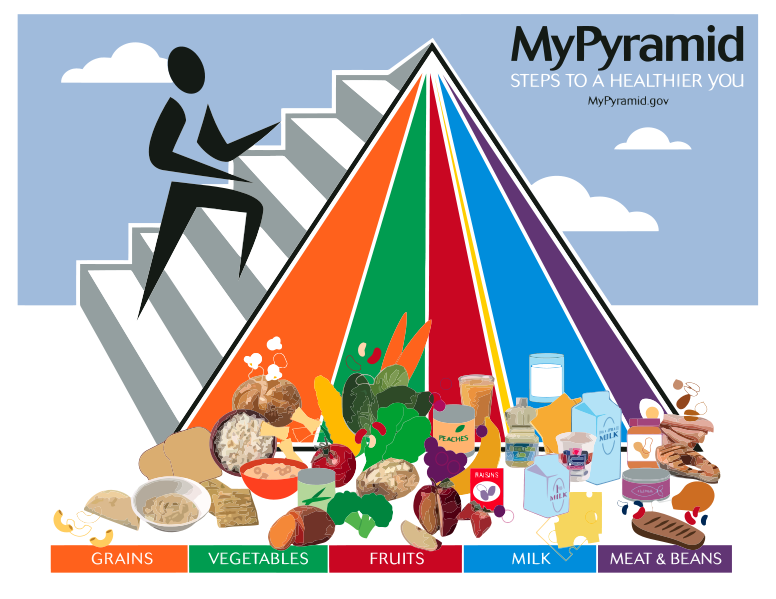 It's not the cookbook's fault, but their use of the food pyramid makes me sad. 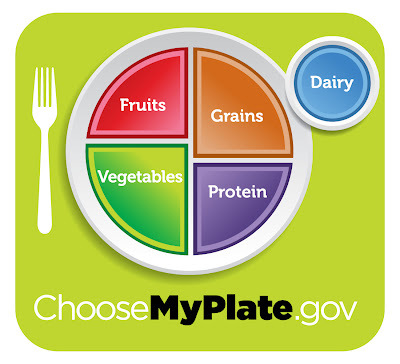 This is because the food pyramid is deeply flawed. Thanks to Michael Pollan's book In Defense of Food, I now know that the nutritionist who was responsible for the design of the pyramid originally made the bottom of the pyramid vegetables - I repeat, vegetables! - while diminishing the grains section to a much smaller slot, and specifying that the grains be whole grains. Then politics got involved, and lobbyists undermined the eating habits of a generation of school children by making it sound as if refined grains, and lots of them, were a required part of a healthy diet. I remember when that food pyramid was enshrined in our school cafeteria food line. It seemed so helpful! So friendly! This pyramid that replaced it was not much of an improvement. Look, all of the food fell off! I am deeply suspicious of those proportions, but that's irrelevant anyway, because it's impossible to read. Finally, it seems like the FDA has realized the error of trying to squeeze too much info into one image. This is much clearer. But it also makes one glaring fault stand out: a major swath of the population can't digest milk. Clearly, dairy is not necessary to a healthful diet, at all, and yet our government persists in telling us that it is, thanks to dairy lobbyists. Refining the Pineapple Bread Pudding. . . Whole grains are SO EASY!